For all the kimchi lovers out there, this Korean inspired hot dog is for you! Preheat your backyard BBQ to high or preheat a grill pan on top of the stove over high heat. To make the Kimchi Ketchup, combine all of the ingredients in the food processor and blend until smooth. For the Slaw, in a mixing bowl whisk together the mayonnaise, rice wine vinegar, sugar, soy sauce and sesame oil. Add the cabbage and toss to combine. Grill the hot dogs until charred and hot throughout, then lightly grill the hot dog buns. Spoon 2 tablespoons of Kimchi Ketchup into each toasted bun and top with a Hoffy Hot Dog. 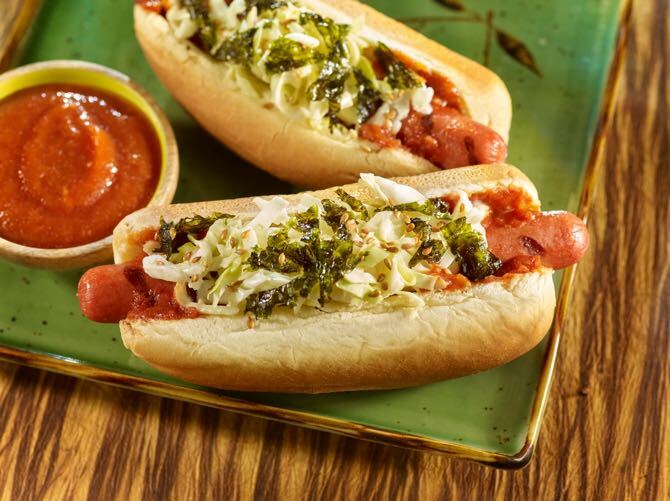 Spoon 1/4-cup of the Slaw on top of the hot dog and garnish with seaweed and sesame seeds.